A couple of years ago, I was happy and proud that we made our own mooncakes for Mid-Autumn Festival. From scratch. By hand. 100% homemade. Like Martha Stewart, but in Asia and without felony charges. They were pretty tasty and I had good intentions about continuing to make them at home. Last year, we just bought some at the store, though. That’s life for ya. I remembered that in the U.S., you could get mooncakes on Amazon. I took a look. They had Maxim’s mooncakes! Wow! Yes! But it was $999 for 10 of them. Wow. No. It appears I’m not the only one in the USA who is ordering mooncakes by mail. Unfortunately, the Prime shipping appears to only apply to the shipping time, not the baking time. Ours aren’t set to arrive until this weekend. I won’t be that sad, though. We’ll still eat them and moon gaze, and pretend that the neighbors’ Halloween decorations are really Mid-Autumn lanterns and floats. 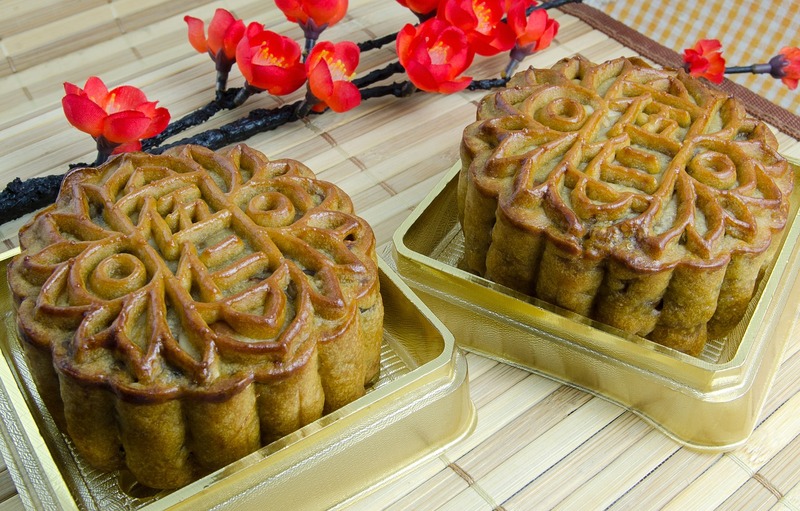 What are your mooncake plans this year? Whether you are close to family or far away this week, and whether you love or hate mooncakes, have a wonderful Mid-Autumn Festival! Mama always said, “Life is like a box of…mooncakes.” I cannot resist cutting each and every one to see if there’s anything good inside. We only like coconut or pineapple or our new favorite…lava custard from Hong Kong. Oh my goodness. But my boys will eat almost anything that’s even remotely sweet, so we just put all the cut halves in a tin and let them have the rejects. We also got a coupon for free Haagen Dazs moon cakes. Which of course are not really mooncakes, and therefore definitely delicious. We love the fruit ones, though some are (dare I say it??) a little too sweet for me. Lava custard and Haagen Dazs sound incredible. Enjoy!! Hmmm…. I wonder if Lee Lee’s has them up here? I did have a red bean bunSunday night at the Hook’s house, thanks to the Changs. Yum!That andRita’s mango custard cups, equally yum.